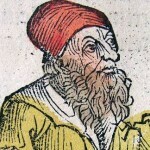 Anaxagoras was a Pre-Socratic Greek philosopher. Born in Clazomenae in Asia Minor, Anaxagoras was the first philosopher to bring philosophy to Athens. According to Diogenes Laertius and Plutarch, in later life he was charged with impiety and went into exile in Lampsacus; the charges may have been political, owing to his association with Pericles. He also gave a number of novel scientific accounts of natural phenomena.